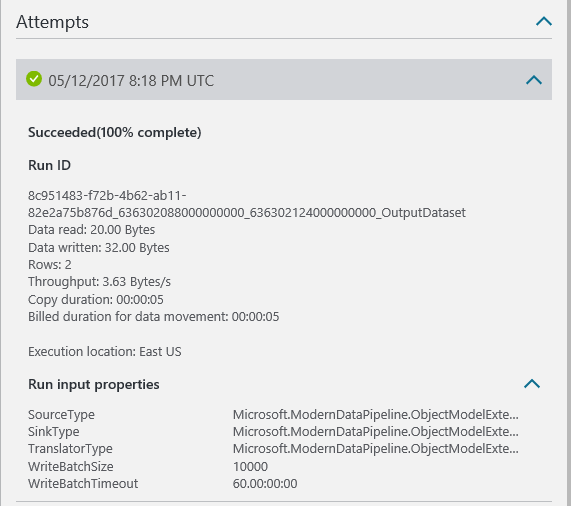 In this article, you learn how to use Azure portal to create a data factory with a pipeline that copies data from an Azure blob storage to an Azure SQL database. 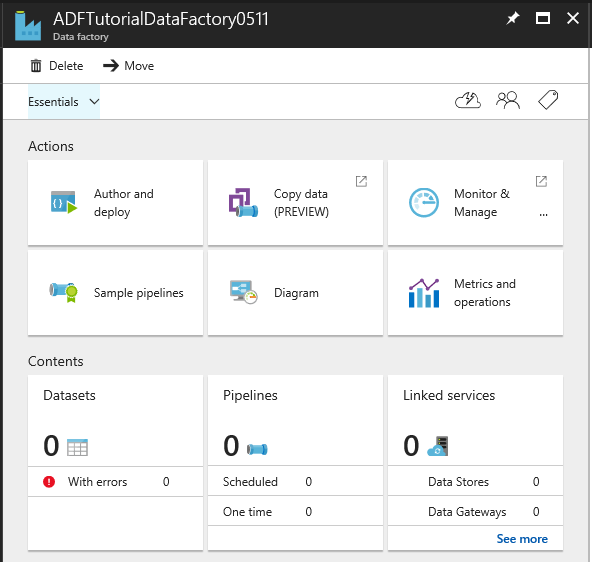 If you are new to Azure Data Factory, read through the Introduction to Azure Data Factory article before doing this tutorial. Complete prerequisites listed in the tutorial prerequisites article before performing this tutorial. 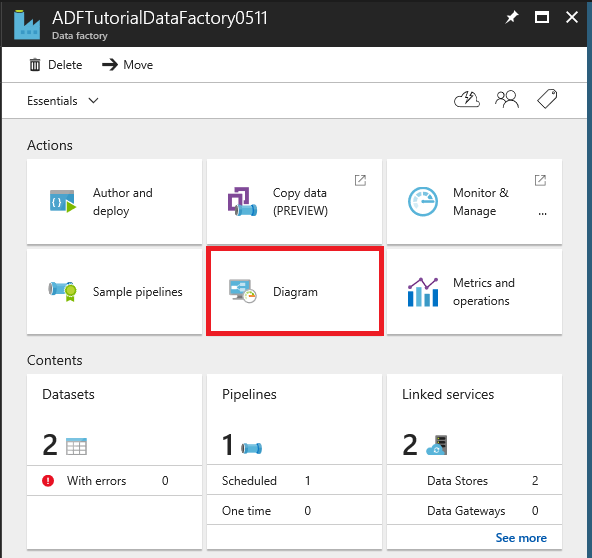 Create an Azure data factory. In this step, you create a data factory named ADFTutorialDataFactory. Monitor the pipeline. 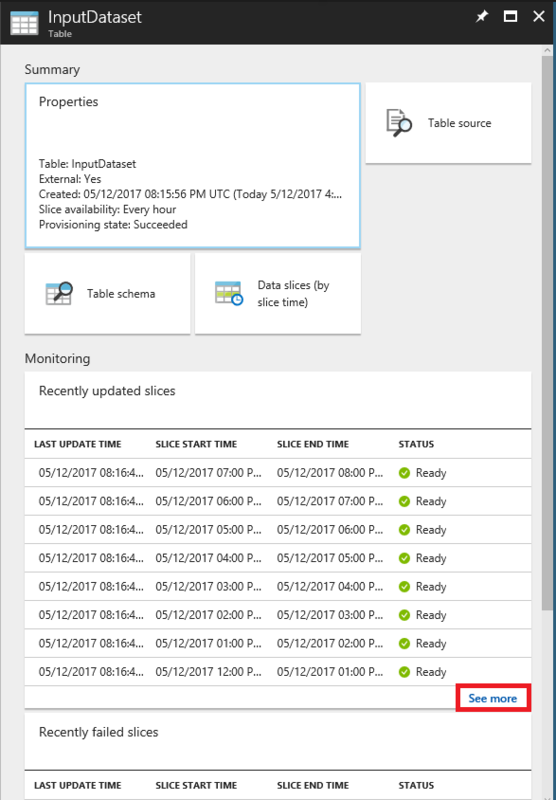 In this step, you monitor the slices of input and output datasets by using Azure portal. 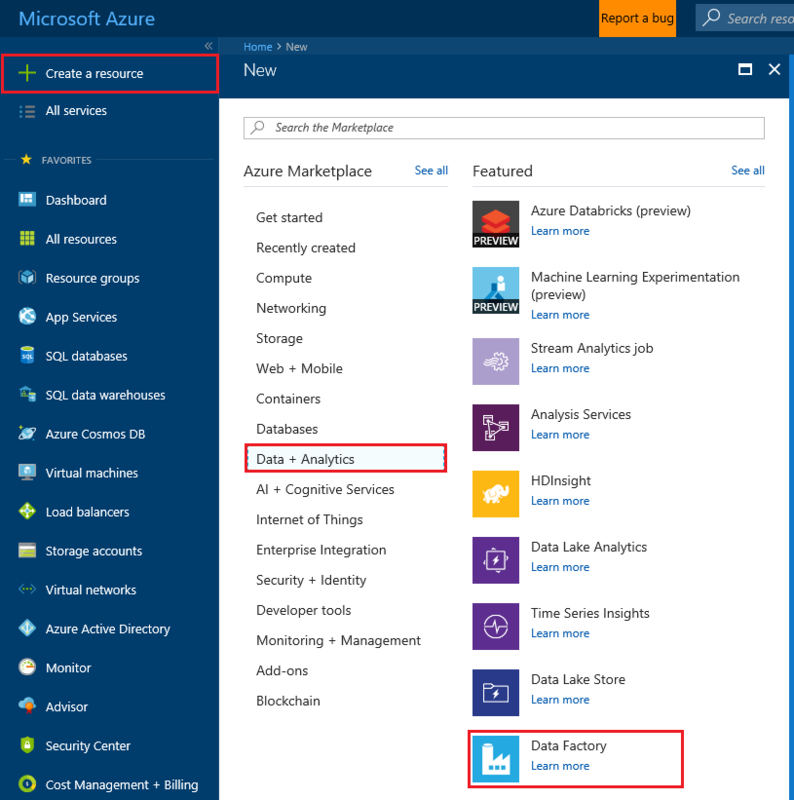 After logging in to the Azure portal, click Create a resource on the left menu, click Data + Analytics, and click Data Factory. Enter ADFTutorialDataFactory for the name. The name of the Azure data factory must be globally unique. If you receive the following error, change the name of the data factory (for example, yournameADFTutorialDataFactory) and try creating again. See Data Factory - Naming Rules topic for naming rules for Data Factory artifacts. Some of the steps in this tutorial assume that you use the name: ADFTutorialResourceGroup for the resource group. 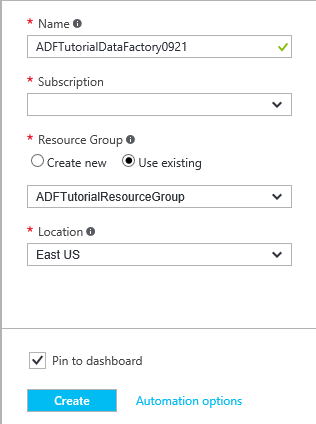 To learn about resource groups, see Using resource groups to manage your Azure resources. Select the location for the data factory. Only regions supported by the Data Factory service are shown in the drop-down list. After the creation is complete, you see the Data Factory blade as shown in the image. In this step, you link your Azure storage account to your data factory. You specify the name and key of your Azure storage account in this section. 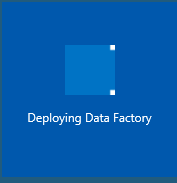 In the Data Factory blade, click Author and deploy tile. In the editor, click New data store button on the toolbar and select Azure storage from the drop-down menu. You should see the JSON template for creating an Azure storage linked service in the right pane. Replace <accountname> and <accountkey> with the account name and account key values for your Azure storage account. Click Deploy on the toolbar. 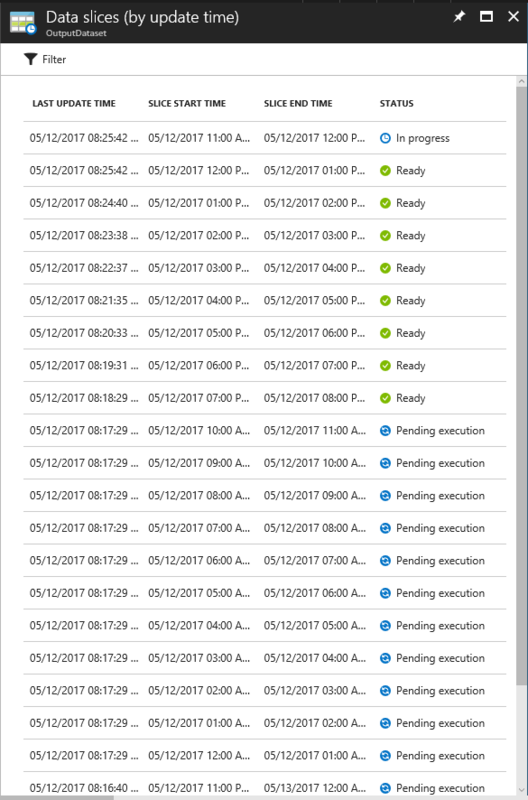 You should see the deployed AzureStorageLinkedService in the tree view now. In this step, you link your Azure SQL database to your data factory. You specify the Azure SQL server name, database name, user name, and user password in this section. In the Data Factory Editor, click New data store button on the toolbar and select Azure SQL Database from the drop-down menu. You should see the JSON template for creating the Azure SQL linked service in the right pane. Replace <servername>, <databasename>, <username>@<servername>, and <password> with names of your Azure SQL server, database, user account, and password. Click Deploy on the toolbar to create and deploy the AzureSqlLinkedService. Confirm that you see AzureSqlLinkedService in the tree view under Linked services. 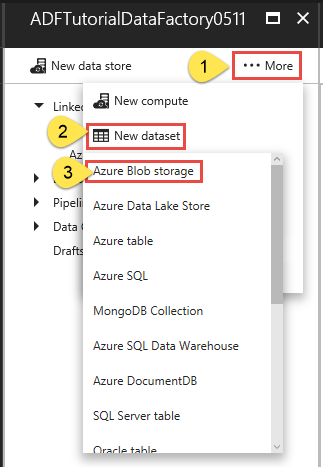 In the Editor for the Data Factory, click ... More, click New dataset, and click Azure Blob storage from the drop-down menu. Click Deploy on the toolbar to create and deploy the InputDataset dataset. Confirm that you see the InputDataset in the tree view. 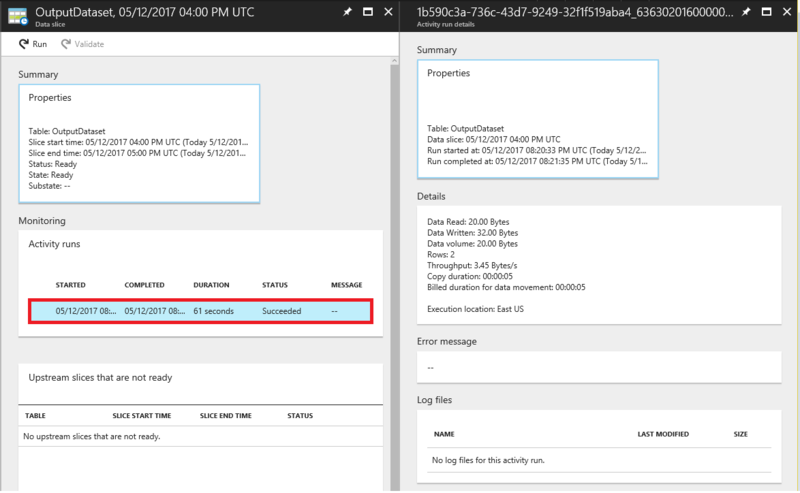 The Azure SQL Database linked service specifies the connection string that Data Factory service uses at run time to connect to your Azure SQL database. 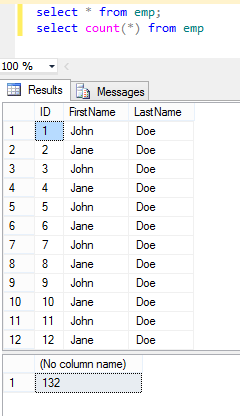 The output SQL table dataset (OututDataset) you create in this step specifies the table in the database to which the data from the blob storage is copied. 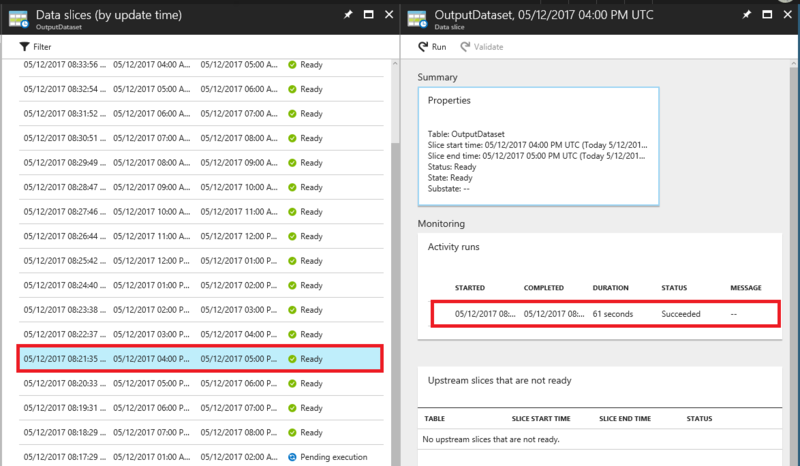 In the Editor for the Data Factory, click ... More, click New dataset, and click Azure SQL from the drop-down menu. Click Deploy on the toolbar to create and deploy the OutputDataset dataset. Confirm that you see the OutputDataset in the tree view under Datasets. 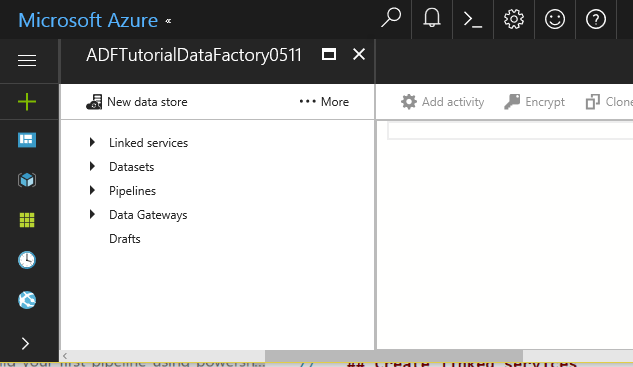 In the Editor for the Data Factory, click ... More, and click New pipeline. Alternatively, you can right-click Pipelines in the tree view and click New pipeline. Both start and end datetimes must be in ISO format. For example: 2016-10-14T16:32:41Z. The end time is optional, but we use it in this tutorial. If you do not specify value for the end property, it is calculated as "start + 48 hours". To run the pipeline indefinitely, specify 9999-09-09 as the value for the end property. Click Deploy on the toolbar to create and deploy the ADFTutorialPipeline. Confirm that you see the pipeline in the tree view. 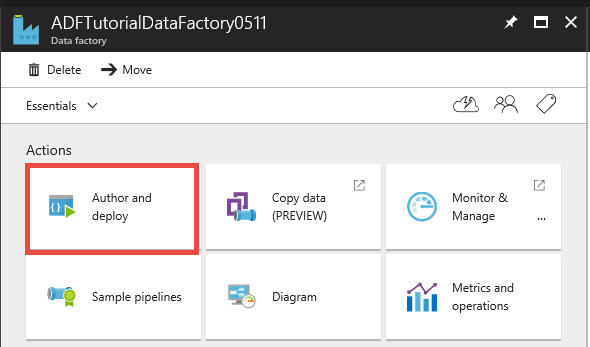 Now, close the Editor blade by clicking X. Click X again to see the Data Factory home page for the ADFTutorialDataFactory. 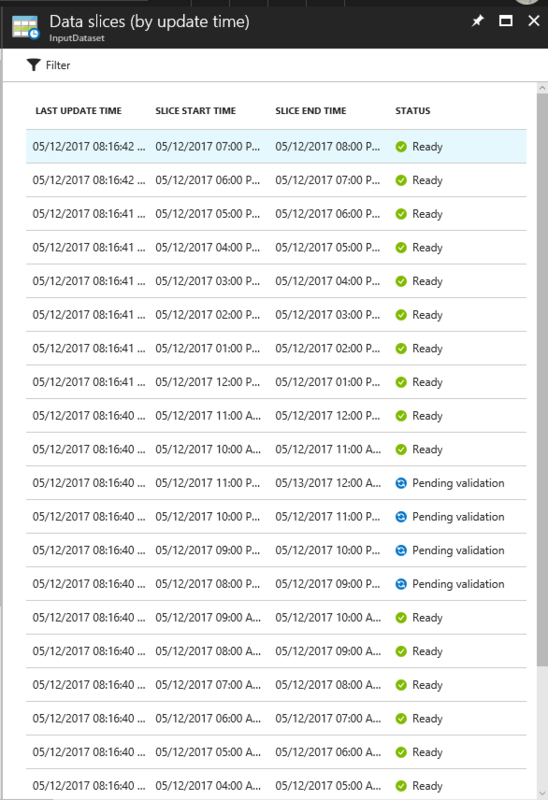 In this step, you use the Azure portal to monitor what’s going on in an Azure data factory. Click Monitor & Manage tile on the home page for your data factory. You should see Monitor & Manage application in a separate tab. If you see that the web browser is stuck at "Authorizing...", do one of the following: clear the Block third-party cookies and site data check box (or) create an exception for login.microsoftonline.com, and then try to open the app again. Change the Start time and End time to include start (2017-05-11) and end times (2017-05-12) of your pipeline, and click Apply. 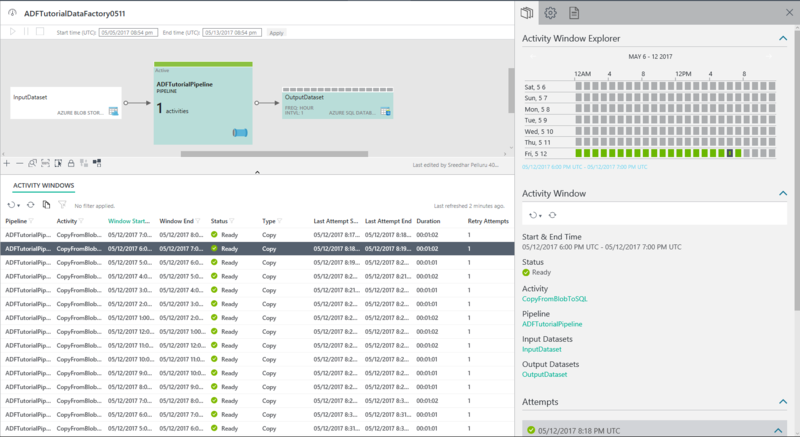 You see the activity windows associated with each hour between pipeline start and end times in the list in the middle pane. To see details about an activity window, select the activity window in the Activity Windows list. In Activity Window Explorer on the right, you see that the slices up to the current UTC time (8:12 PM) are all processed (in green color). The 8-9 PM, 9 - 10 PM, 10 - 11 PM, 11 PM - 12 AM slices are not processed yet. The Attempts section in the right pane provides information about the activity run for the data slice. If there was an error, it provides details about the error. For example, if the input folder or container does not exist and the slice processing fails, you see an error message stating that the container or folder does not exist. 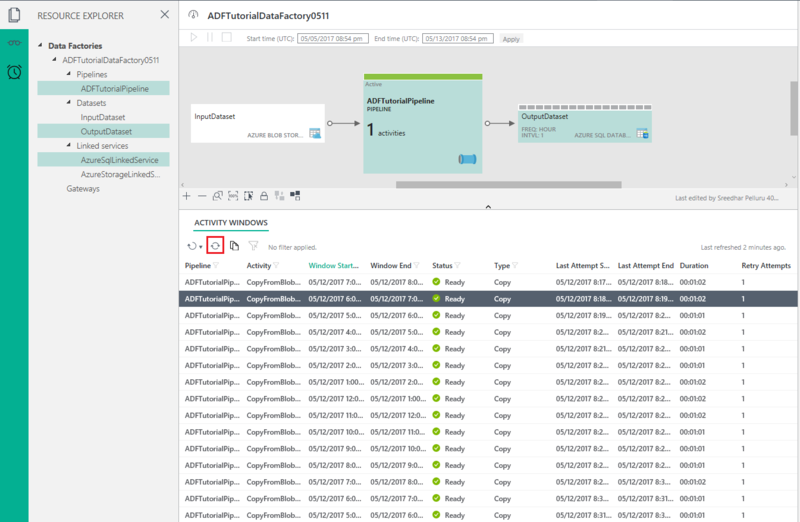 Launch SQL Server Management Studio, connect to the Azure SQL Database, and verify that the rows are inserted in to the emp table in the database. 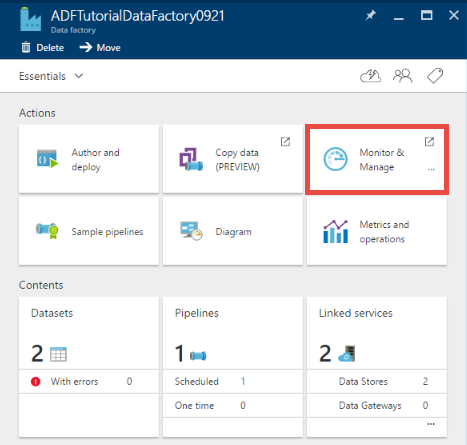 For detailed information about using this application, see Monitor and manage Azure Data Factory pipelines using Monitoring and Management App. You can also monitor data pipelines by using the diagram view. In the Data Factory blade, click Diagram. In the diagram view, double-click InputDataset to see slices for the dataset. Click See more link to see all the data slices. You see 24 hourly slices between pipeline start and end times. Notice that all the data slices up to the current UTC time are Ready because the emp.txt file exists all the time in the blob container: adftutorial\input. The slices for the future times are not in ready state yet. Confirm that no slices show up in the Recently failed slices section at the bottom. Close the blades until you see the diagram view (or) scroll left to see the diagram view. Then, double-click OutputDataset. Click See more link on the Table blade for OutputDataset to see all the slices. Notice that all the slices up to the current UTC time move from pending execution state => In progress ==> Ready state. The slices from the past (before current time) are processed from latest to oldest by default. For example, if the current time is 8:12 PM UTC, the slice for 7 PM - 8 PM is processed ahead of the 6 PM - 7 PM slice. The 8 PM - 9 PM slice is processed at the end of the time interval by default, that is after 9 PM. Click any data slice from the list and you should see the Data slice blade. A piece of data associated with an activity window is called a slice. A slice can be one file or multiple files. If the slice is not in the Ready state, you can see the upstream slices that are not Ready and are blocking the current slice from executing in the Upstream slices that are not ready list. In the DATA SLICE blade, you should see all activity runs in the list at the bottom. Click an activity run to see the Activity run details blade. In this blade, you see how long the copy operation took, what throughput is, how many bytes of data were read and written, run start time, run end time etc. Click X to close all the blades until you get back to the home blade for the ADFTutorialDataFactory. (optional) click the Datasets tile or Pipelines tile to get the blades you have seen the preceding steps.